The story is set in Middle-earth seventy-seven years before the main events of The Lord of the Rings, and portions of the film are adapted from the appendices to Tolkien's The Return of the King. An Unexpected Journey tells the tale of Bilbo Baggins (Martin Freeman), who is convinced by the wizard Gandalf (Ian McKellen) to accompany thirteen Dwarves, led by Thorin Oakenshield (Richard Armitage), on a quest to reclaim the Lonely Mountain from the dragon Smaug. The ensemble cast also includes James Nesbitt, Ken Stott, Cate Blanchett, Ian Holm, Christopher Lee, Hugo Weaving, Elijah Wood and Andy Serkis, and features Sylvester McCoy, Barry Humphries and Manu Bennett. An Unexpected Journey premiered on 28 November 2012 in New Zealand and was released internationally on 12 December 2012. The film grossed over $1.021 billion at the box office, surpassing both The Fellowship of the Ring and The Two Towers nominally, becoming the fourth highest-grossing film of 2012 and the 35th highest-grossing film of all time. Receiving mixed reviews from critics, the film was nominated for three Academy Awards for Best Visual Effects, Best Production Design, and Best Makeup and Hairstyling. It was also nominated for three British Academy Film Awards. Approaching his 111th birthday,[a] the Hobbit Bilbo Baggins begins writing down the full story of his adventure 60 years earlier for the benefit of his nephew Frodo. Long before Bilbo's involvement, the Dwarf king Thrór brought an era of prosperity for his kin under the Lonely Mountain until the arrival of the dragon Smaug. Destroying the nearby town of Dale, Smaug drove the Dwarves out of their mountain and took their hoard of gold. Thrór's grandson, Thorin, sees King Thranduil and his Wood-elves on a nearby hillside, and is dismayed when they leave rather than aid his people, resulting in Thorin's everlasting hatred of Elves. In the Shire, 50-year-old Bilbo is tricked by the wizard Gandalf the Grey into hosting a party for Thorin and his company of Dwarves: Balin, Dwalin, Fíli, Kíli, Dori, Nori, Ori, Óin, Glóin, Bifur, Bofur, and Bombur. Gandalf's aim is to recruit Bilbo as the company's "burglar" to aid them in their quest to enter the Lonely Mountain. Bilbo is unwilling to accept at first, but has a change of heart after the company leaves without him the next day. Travelling onward, the company is captured by three Trolls. Bilbo stalls the Trolls from eating them until dawn, and Gandalf exposes the trolls to sunlight, turning them to stone. The company locates the Trolls' cave and finds treasure and Elven blades. Thorin and Gandalf each take an Elf-made blade, Orcrist and Glamdring, respectively; Gandalf also finds an Elven dagger, which he gives to Bilbo. The wizard Radagast the Brown finds Gandalf and the company, and recounts an encounter at Dol Guldur with the Necromancer, a sorcerer who has been corrupting Greenwood with dark magic. Chased by Orcs, Gandalf leads the company through a hidden passage to Rivendell. There, Lord Elrond discloses a hidden indication of a secret door on the company's map of the Lonely Mountain, which will be visible only on Durin's Day. Gandalf later approaches the White Council — consisting of Elrond, Galadriel and Saruman the White — and presents a Morgul blade, a weapon of the Witch-king of Angmar, which Radagast obtained from Dol Guldur as a sign that the Necromancer is linked to an eventual return of Sauron. While Saruman presses concern to the more present matter of the Dwarves' quest, requesting that Gandalf put an end to it, Gandalf secretly reveals to Galadriel he had anticipated this and had the Dwarves move forward without him. The company journeys into the Misty Mountains, where they find themselves amid a colossal battle between Stone Giants. They take refuge in a cave and are captured by Goblins, who take them to their leader, the Great Goblin. Bilbo becomes separated from the Dwarves and falls into a crevice where he encounters Gollum, who unknowingly drops a golden ring. Pocketing the ring, Bilbo finds himself confronted by Gollum. They play a riddle game, wagering that Bilbo will be shown the way out if he wins or eaten by Gollum if he loses. Bilbo eventually wins by asking Gollum what he has in his pocket. Noticing his ring is lost, Gollum realizes that Bilbo possesses it and chases him. Bilbo discovers that the ring grants him invisibility, but when he has a chance to kill Gollum, Bilbo spares his life out of pity and escapes while Gollum shouts his hatred towards the hobbit Baggins. Meanwhile, the Great Goblin reveals to the Dwarves that Azog, an Orc war-chief who killed Thrór and lost his forearm to Thorin in battle outside the Dwarven kingdom of Moria, has placed a bounty on Thorin's head. Gandalf arrives and leads the Dwarves in an escape, killing the Great Goblin. Bilbo exits the mountain and rejoins the company, keeping his newly obtained ring secret. The company is ambushed by Azog and his hunting party, and takes refuge in trees. Thorin charges at Azog, who overpowers and severely injures him with his Warg. Bilbo saves Thorin from the Orcs just as the company is rescued by eagles. They escape to the safety of the Carrock where Gandalf revives Thorin, who renounces his previous disdain for Bilbo after being saved by him. They see the Lonely Mountain in the distance, where a sleeping Smaug is awoken by a thrush knocking a snail against a stone. The characters of Galadriel, Saruman, and Frodo Baggins appear in the novel The Lord of the Rings, but not in the novel The Hobbit. (Radagast was also dropped from the film version of Lord of the Rings, merely being mentioned in passing). Gandalf, Gollum, Bilbo Baggins, Elrond and the Necromancer appear in both novels, although the latter is referred to in Lord of the Rings as Sauron. Only Bilbo is portrayed by a different actor in the two sets of films, as the age difference affects his character more. The older Bilbo (Ian Holm) appears in the prologue section of this film. Martin Freeman as Young Bilbo Baggins: a hobbit hired by the wizard Gandalf to accompany 13 dwarves on a quest to reclaim the Lonely Mountain from the dragon Smaug. Ian Holm, who portrayed Old Bilbo Baggins in The Lord of the Rings trilogy appears also in scenes that take place directly before the events of The Fellowship of the Ring. Ian McKellen as Gandalf the Grey: a wizard who recruits Bilbo and helps to arrange the quest to reclaim the dwarves' lost treasure in Erebor. Gandalf was also portrayed by McKellen in The Lord of the Rings film trilogy. Richard Armitage as Thorin Oakenshield II: the leader of the Company of dwarves who has set out to reclaim his birthright as King of the Lonely Mountain from Smaug. Ken Stott as Balin: Dwalin's brother. He is described in the novel as "always their look-out man". Graham McTavish as Dwalin: Balin's brother. Aidan Turner as Kíli: Thorin's nephew and Fíli's younger brother. Dean O'Gorman as Fíli: Thorin's nephew and Kíli's older brother. Mark Hadlow as Dori: Nori and Ori's brother. He is described in the novel as "a decent fellow, despite his grumbling", while Thorin described him as being the strongest member of the Company. Hadlow also plays Bert the Stone-troll. Jed Brophy as Nori: Dori and Ori's brother. Adam Brown as Ori: Dori and Nori's brother. John Callen as Óin: Gloin's brother. Peter Hambleton as Glóin: Óin's brother. Hambleton also plays William the Stone-troll. William Kircher as Bifur: Bofur and Bombur's cousin. Kircher also plays Tom the Stone-troll. James Nesbitt as Bofur: Bombur's brother and Bifur's cousin, described as "a disarmingly forthright, funny and occasionally brave Dwarf". Stephen Hunter as Bombur: Bofur's brother and Bifur's cousin; described in the novel as fat and clumsy. Cate Blanchett as Galadriel: the elven co-ruler of Lothlórien along with her husband, Lord Celeborn. She was also portrayed by Blanchett in The Lord of the Rings film trilogy. Hugo Weaving as Elrond: the Elven-Lord of Rivendell, who gives shelter to Bilbo's party, despite Thorin's great suspicion of Elves. He was also portrayed by Weaving in The Lord of the Rings film trilogy. Christopher Lee as Saruman the White: the head of the Istari Order and its White Council. He was also portrayed by Lee in The Lord of the Rings film trilogy. Elijah Wood as Frodo Baggins: Bilbo's favorite nephew. His scenes take place shortly before the events of The Fellowship of the Ring. Sylvester McCoy as Radagast the Brown: a wizard whose wisdom involves nature and wildlife. Andy Serkis as Gollum: a wretched hobbit-like creature corrupted by the One Ring. Serkis portrayed Gollum through motion capture, as he did in The Lord of the Rings film trilogy. Serkis also acted as second unit director of the trilogy. Manu Bennett as Azog the Defiler: the Orc chieftain of Moria who beheaded King Thrór in the battle of Azanulbizar and now hunts for Thorin and his Company after taking an oath to break the line of Durin. He leads a band of Hunter Orcs and rides a huge white warg. Barry Humphries as the Great Goblin: the king of the underground caverns of Goblin Town in the Misty Mountains. Conan Stevens as Bolg: son of Azog. John Rawls as Yazneg: Azog's second-in-command. Movement choreographer Terry Notary played Yazneg during pick-up shots. Bret McKenzie as Lindir: an elf of Rivendell. Kiran Shah as the Goblin scribe: a scribe and messenger for the Great Goblin. Jeffrey Thomas as Thrór: the former king of Durin's Folk and Thorin's grandfather. Stephen Ure as Fimbul, one of Azog's Orc hunters, and lieutenant to Yazneg. After Yazneg is killed, Fimbul becomes Azog's right-hand man. Ure also played a goblin, named Grinnah, who acted as the Great Goblin's acolyte. Michael Mizrahi as Thráin II: the last Dwarf-King of Erebor and Thorin's father. Benedict Cumberbatch as the voice of the dragon Smaug, as well as The Necromancer, a mysterious sorcerer residing in Dol Guldur with the ability to summon the spirits of the dead. Cumberbatch provided performance capture for the character's brief appearance in this film. Cameos in the film include director Peter Jackson and editor Jabez Olssen as Erebor Dwarf refugees running from the dragon Smaug in the opening prologue; picture double Hayden J. Weal as a dwarf carrying gems during Thranduil's visit in Erebor; James Nesbitt's then-wife Sonia Forbes-Adam as Belladonna Took, Bilbo's mother; Nesbitt's daughters Peggy and Mary as children of Dale; Luke Evans as Girion; and production designer Dan Hennah as the Old Took, Belladonna's father. Peter Jackson's daughter, Philippa Boyens's second son, and Andy Serkis' children made cameos in the Old Took's party; and Jabez Olssen's wife and children, Weta Workshop founder Richard Taylor's children, and set decorator Ra Vincent's children all cameo in the market scene. Writer for Ain'tItCoolNews.com, Eric Vespe, portrays Fredegar Chubb, the fish seller at the market. The cameos in the Old Took's party and the market scene are shown only in the extended edition. A film adaptation of J. R. R. Tolkien's novel The Hobbit (1937) was in development for several years after the critical and financial success of The Lord of the Rings film trilogy (2001–2003), co-written, co-produced, and directed by Peter Jackson. Jackson was initially going to produce a two-film adaptation of The Hobbit, which was to be directed by Guillermo del Toro. Del Toro left the project in May 2010, after about two years of working with Jackson and his production team, due to delays caused in part by financial problems at Metro-Goldwyn-Mayer. Jackson was announced as director that October. The Hobbit: An Unexpected Journey used a shooting and projection frame rate of 48 frames per second, becoming the first feature film with a wide release to do so. The new projection rate was advertised as "High Frame Rate" to the general public. However, the majority of cinemas projected the film at the industry standard 24 fps after the film was converted. The musical score for An Unexpected Journey was composed, orchestrated, conducted and produced by Howard Shore. It was performed by the London Philharmonic Orchestra, London Voices and Tiffin' Boys Choir and featured several vocal soloists. The score reprised many themes from the Lord of the Rings trilogy but also introduced numerous new themes, including Shore's orchestral setting of the diegetic "Misty Mountains" song. The original song "Song of the Lonely Mountain", sung by Neil Finn, served as the end title theme. The album received nominations for various awards and peaked in the top ten charts in Korea and the United States. According to news reports, up to 27 animals died during the production of The Hobbit: An Unexpected Journey. The first trailer for An Unexpected Journey was first screened before the Jackson-produced The Adventures of Tintin in the US on 21 December 2011, and released on the Internet on the same day. Geoff Boucher of the Los Angeles Times said, "While it was all too fleeting there was enough in it to stir the heart of fans." Jen Chaney of The Washington Post stated, "Visually and tonally, this preview for [An Unexpected Journey] looks like a perfect match for the Frodo Baggins tales that released in 2001, 2002 and 2003. […] But plot isn't the main matter at hand in the trailer… This clip is all about reacquainting us with Middle-earth." On 8 October 2012, Wellington Mayor Celia Wade-Brown announced that for the week of the premiere of The Hobbit: An Unexpected Journey, the capital of New Zealand would be renamed the "Middle of Middle-earth". Guardians of Middle-earth, which was released with the special disclaimer on the front art, marking the connection to the feature film and contains models and characters from The Hobbit: An Unexpected Journey, including Nori, Gollum, Dwalin and others. Lego The Lord of the Rings, which was released around the same time as the motion picture and contains a Lego model of Radagast, based on his portrayal in The Hobbit: An Unexpected Journey. 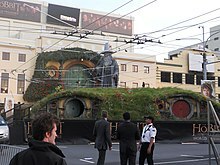 The world premiere of The Hobbit: An Unexpected Journey took place on 28 November 2012 at the Embassy Theatre in Wellington, New Zealand, with a full theatrical release in New Zealand on 12 December. The film was released 13 December 2012 in Europe, 14 December 2012 in India, Canada and United States, and 26 December 2012 (Boxing Day) in Australia. It was also screened at the 65th Royal Film Performance in London on 12 December 2012. Around 100,000 people lined the red carpet on Courtenay Place for the film's premiere, and the entire event was broadcast live on TV in New Zealand, as well as streaming over the internet. An extended edition of the film had a limited re-release on 5 October 2015, accompanied by a special greeting from Peter Jackson. The Hobbit: An Unexpected Journey was released on DVD, Blu-ray and Blu-ray 3D on 19 March 2013, with an extended edition, with 13 minutes of additional footage and three bonus discs containing approximately nine hours of special features, released on 5 November 2013. In the United Kingdom, the film was released on 8 April 2013. The Hobbit: An Unexpected Journey grossed $303 million in the United States and Canada and $718.1 million elsewhere for a worldwide total of $1.021 billion, becoming the 15th film in history to reach $1 billion. It is the fourth highest-grossing film of 2012 and the 31st highest-grossing film of all time. It scored a worldwide opening weekend of $222.6 million, including $15.1 million from 452 IMAX theaters around the world, which was an IMAX opening-weekend record for December. An Unexpected Journey earned $13.0 million during its midnight run, setting a December midnight record (previously held by Avatar). It then topped the box office on its opening day (Friday, 14 December 2012) earning $37.1 million from 4,045 theaters (midnight earnings included), setting a December opening-day record (previously held by The Lord of the Rings: The Return of the King). By the end of its first weekend it grossed $84.62 million, finishing in first place and setting a then December opening-weekend record (previously held by I Am Legend). 3D showings accounted for 49% of weekend ticket sales while IMAX showings generated $10.1 million (12% of the weekend gross). The film held onto the top spot for a second weekend, despite declining 57% to $36.7 million. An Unexpected Journey remained at the top of the box office during its third weekend, dropping only 11% to $32.9 million. 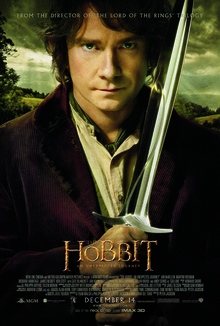 An Unexpected Journey earned $11.2 million on its opening day (Wednesday, 12 December 2012) from 16 markets. Through its first Sunday, it managed a five-day opening-weekend gross of just under $138.0 million. It topped the box office outside North America on two consecutive weekends. In Sweden, it scored the second-largest five-day opening with $6.20 million (behind Harry Potter and the Deathly Hallows – Part 2). Its three largest openings occurred in the UK, Ireland, and Malta ($18.8 million); Russia and the CIS ($17.8 million), and Germany ($17.1 million). After the New Zealand premiere, Television New Zealand noted that critical responses were "largely positive" but with "mixed responses to the film's technological advances". After the film's international release, Forbes called reviews "unenthusiastic" and the Los Angeles Times said the critical consensus is that the film "stumbles". The film holds a 65% rating on Rotten Tomatoes based on 293 reviews, with an average score of 6.5/10. The site's consensus reads "Peter Jackson's return to Middle-earth is an earnest, visually resplendent trip, but the film's deliberate pace robs the material of some of its majesty." On Metacritic, the film has a score of 58 out of 100 based on collected reviews from 40 critics, indicating "mixed or average reviews". The main contention of debate was regarding the film's length, its controversial High Frame Rate, and whether or not the film matched the level of expectation built from The Lord of the Rings film trilogy, while the film's visual style, special effects, music score, and cast were praised, especially the performances of Martin Freeman, Ian McKellen, Richard Armitage, and Andy Serkis. According to CinemaScore polls, the film received an "A" grade from audiences. Peter Travers of Rolling Stone criticised the film's use of "48 frames per second… Couple that with 3D and the movie looks so hyper-real that you see everything that's fake about it… The 169 minutes of screen time hurts, since the first 45 minutes of the film traps us in the hobbit home of the young Bilbo Baggins," but continued with "Once Bilbo and the dwarves set on their journey… things perk up considerably. Trolls, orcs, wolves and mountainous monsters made of remarkably pliable stone bring out the best in Jackson and his Rings co-screenwriters Fran Walsh and Philippa Boyens." Robbie Collin of The Daily Telegraph gave the film two stars out of five and said "Thank heavens for Andy Serkis, whose riddling return as Gollum steals the entire film. It is the only time the digital effects and smoother visuals underline, rather than undermine, the mythical drama of Bilbo's adventure. As a lover of cinema, Jackson’s film bored me rigid; as a lover of Tolkien, it broke my heart." He thought the film was "so stuffed with extraneous faff and flummery that it often barely feels like Tolkien at all – more a dire, fan-written internet tribute." Time Out magazine's Keith Uhlich praised the film as "a mesmerizing study in excess, Peter Jackson and company's long-awaited prequel to the Lord of the Rings saga is bursting with surplus characters, wall-to-wall special effects, unapologetically drawn-out story tangents and double the frame rate (48 over 24) of the average movie." The Guardian magazine's Peter Bradshaw commented on use of high frame rate technology and length of the film, writing "After 170 minutes, I felt that I had had enough of a pretty good thing. The trilogy will test the stamina of the non-believers, and many might feel ... that the traditional filmic look of Lord of the Rings was better." Richard Lawson from The Atlantic Wire commented on the film's "video game"-like visual effects, saying "this is a dismally unattractive movie, featuring too many shots that I'm sure were lovely at some point but are now ruined and chintzified by the terrible technology monster." Matthew Leyland of Total Film gave the film a five-star rating and said that it is "Charming, spectacular, technically audacious… in short, everything you expect from a Peter Jackson movie. A feeling of familiarity does take hold in places, but this is an epically entertaining first course." Ed Gonzalez of Slant Magazine awarded the film three stars out of four and called it "The first of an arguably gratuitous three-part cine-extravaganza." Todd McCarthy of The Hollywood Reporter said that "Jackson and his colleagues have created a purist's delight… [And leads to] an undeniably exciting, action-packed climax." McCarthy did however think that "Though there are elements in this new film that are as spectacular as much of the Rings trilogy was… there is much that is flat-footed and tedious as well, especially in the early going." Kate Muir of The Times gave the film four out of five stars, saying Martin Freeman "perks up" the film as Bilbo Baggins and that Jackson's use of 48 frames per second 3D technology gives the film "lurid clarity". Dan Jolin of Empire gave the film four out of five stars and thought "The Hobbit plays younger and lighter than Fellowship and its follow-ups, but does right by the faithful and has a strength in Martin Freeman's Bilbo that may yet see this trilogy measure up to the last one" and he stated that "There is treasure here". The film received three Academy Award nominations for Best Visual Effects, Best Production Design, and Best Makeup and Hairstyling as well as praise from critics organization Broadcast Film Critics Association and from critics groups, such as the Houston Film Critics Society, Phoenix Film Critics Society and Washington D.C. Area Film Critics Association. The film's team won an Academy Scientific and Technical Award—the Scientific and Engineering Award for inventing a technique which has made huge advances in bringing to life computer-generated characters such as Gollum in the film to the screen. In January 2013, it was announced The Hobbit: An Unexpected Journey was nominated in the Best Live Action Motion Picture category at the Cinema Audio Society Awards, awarded on 16 February. An Unexpected Journey led the nominations at the 39th Saturn Awards with nine, more than The Lord of the Rings: The Fellowship of the Ring which earned eight nominations at the time of its release. These nominations included Best Director (Peter Jackson's eleventh Saturn Award nomination), Best Actor for Martin Freeman, Best Supporting Actor for Ian McKellen (his third nomination for playing Gandalf) and Best Music for Howard Shore. It won Best Production Design for Dan Hennah, Ra Vincent and Simon Bright. An Unexpected Journey also earned five nominations at the 18th Empire Awards, winning in two categories, Best Actor for Martin Freeman and Best Science Fiction/Fantasy Film. It also earned two nominations at the 2013 MTV Movie Awards in the categories Best Scared-as-S**t Performance and Best Hero for Martin Freeman. Freeman won the latter award for his performance. It has gathered 6 nominations at the 2013 SFX Awards, including Best Film, Best Director for Peter Jackson and four acting nominations. ^ As seen in The Lord of the Rings: The Fellowship of the Ring. ^ "The Hobbit: An unexpected Journey (2012)". British Board of Film Classification. Retrieved 21 December 2013. ^ "The Hobbit: An Unexpected Journey". BFI. Retrieved 21 December 2013. ^ Masters, Kim (17 October 2012). "'The Hobbit:' Inside Peter Jackson and Warner Bros.' $1 Billion Gamble". The Hollywood Reporter. Retrieved 21 December 2013. A knowledgeable source says the first two installments cost $315 million each, and that's with Jackson deferring his fee. A studio source insists that number is wildly inflated and, with significant production rebates from New Zealand, the cost is closer to $200 million a movie. ^ "'Hobbit' Sequel Reigns at Box Office". The Wall Street Journal. Retrieved 21 December 2013. ^ a b "The Hobbit: An Unexpected Journey". Box Office Mojo. Retrieved 26 March 2016. ^ "The Hobbit: An Unexpected Journey : Your unexpected questions answered". CNN. Archived from the original on 12 April 2013. Retrieved 22 December 2014. ^ "The Hobbit Worldwide Release Dates". TheHobbit.com. Retrieved 21 December 2013. ^ "2013 Oscar Nominees | 85th Academy Awards Nominees". Oscar.go.com. Retrieved 21 December 2013. ^ Daisy Bowie-Sell (9 January 2013). "Bafta Awards 2013: The Hobbit snubbed in Bafta nominations". London: The Telegraph. Retrieved 22 December 2013. ^ "Martin Freeman to play Bilbo Baggins in The Hobbit". News. United Kingdom: BBC. 22 October 2010. Retrieved 24 October 2010. ^ Busis, Hillary (22 April 2011). "'The Hobbit': Ian Holm is officially in as old Bilbo". Entertainment Weekly. Retrieved 26 November 2012. ^ "Ian McKellen as Gandalf in The Hobbit". McKellen. Retrieved 11 January 2011. ^ "Christopher Lee Talks Saruman in The Hobbit: An Unexpected Journey". Retrieved 26 November 2012. ^ "New Hobbit: An Unexpected Journey Pics: Elijah Wood Returns as Frodo; Martin Freeman's Bilbo Gets His Sword". Retrieved 26 November 2012. ^ "Andy Serkis Signed To Reprise Gollum In 'The Hobbit'". Deadline Hollywood. 10 January 2011. Retrieved 11 January 2011. ^ Fleming, Mike. "Benedict Cumberbatch To Voice Smaug in 'The Hobbit'". Deadline.com. Retrieved 8 January 2013. ^ Netburn, Deborah (24 April 2008). "Guillermo del Toro to direct 'The Hobbit' and sequel". Los Angeles Times. Retrieved 22 September 2012. ^ a b Alexander, Bryan (5 November 2010). "Guillermo del Toro on Losing the 'Hobbit': 'I Have a Huge Heartbreak'". The Hollywood Reporter. Retrieved 22 September 2012. ^ Trumbore, Dave (20 March 2011). "Production Officially Begins on Peter Jackson’s ''The Hobbit; Plus Two New Images and the Official Synopsis". Collider. Retrieved 22 September 2012. ^ Zakarin, Jordan (6 July 2012). "'The Hobbit' Completes Filming, Peter Jackson Posts Facebook Message (Photo)". The Hollywood Reporter. Retrieved 22 September 2012. ^ Masters, Kim (1 August 2012). "No One Knows How Much Peter Jackson's New 'Hobbit' Film Will Cost". The Hollywood Reporter. Retrieved 22 September 2012. ^ Watercutter, Angela (26 November 2012). "Peter Jackson Races to Complete The Hobbit in Time for Premiere". Wired. Retrieved 28 November 2012. ^ Carolyn Giardina (7 November 2012). "Showeast 2012: Major Exhibitors Sign for High Frame-Rate 'Hobbit' Despite Format Challenges". The Hollywood Reporter. Retrieved 8 November 2012. ^ Trenholm, Rich (15 November 2012). "The Hobbit in 48fps HFR limited to select UK cinemas". CNET. Retrieved 16 June 2013. ^ Jeff Blagdon (8 November 2012). "Peter Jackson's 48fps version of 'The Hobbit' screening at 450 theaters in North America". The Verge. Retrieved 16 June 2013. ^ Wyatt, Daisy; Walker, Tim (2013-11-26). "27 animals died during filming of Hollywood blockbuster The Hobbit: An Unexpected Journey, says report". The Independent. Retrieved 2016-06-22. ^ Memmott, Mark (2012-11-19). "27 Animals In 'Hobbit' Movie Died At Farm Where They Were Housed". NPR. Retrieved 2016-06-22. ^ Eames, Tom (16 December 2011). "'The Hobbit' trailer confirmed to air before 'Tintin' in US". Digital Spy. Retrieved 22 September 2012. ^ a b Chaney, Jen (20 December 2011). "'The Hobbit' trailer: Once more into Middle-earth". Washington Post. Retrieved 22 September 2012. ^ Boucher, Geoff (20 December 2011). "'The Hobbit' trailer brings back magic (and not just for fans)". Los Angeles Times. Retrieved 22 September 2012. ^ Vary, Adam B. (14 July 2012). "'The Hobbit' Comic-Con panel: Peter Jackson gifts a bounty of footage upon Hall H". Entertainment Weekly. Retrieved 25 September 2012. ^ The Hobbit UK (19 October 2012). "The adventure begins a day early!". Facebook. ^ Kemp, Stuart (24 September 2012). "'The Hobbit: An Unexpected Journey' Gets Royal Appointment". The Hollywood Reporter. Retrieved 24 September 2012. ^ "Live Stream of the Hobbit Premiere". 3 News NZ. 28 November 2012. Archived from the original on 28 December 2012. Retrieved 27 November 2012. ^ "The Hobbit: An Unexpected Journey". Blu-ray.com. Retrieved 18 January 2013. ^ "The Hobbit: An Unexpected Journey Blu-ray: Extended Edition". Blu-ray.com. Retrieved 23 September 2013. ^ Sims, Andrew (8 December 2012). "'The Hobbit: An Unexpected Journey' Extended Edition will run over 3 hours". Hypable. Archived from the original on 12 December 2012. Retrieved 15 December 2012. ^ "The Hobbit: An Unexpected Journey Extended Edition Scene Guide". The Onering.net. 25 October 2013. Retrieved 5 November 2013. ^ "The Hobbit: An Unexpected Journey Blu-ray Review (Extended Edition)". Blu-ray.com. 31 October 2013. Retrieved 7 November 2013. ^ "The Hobbit: An Unexpected Journey Blu-ray extras revealed". Total Film. 6 February 2013. Retrieved 28 February 2013. ^ "2012 Worldwide Grosses". Box Office Mojo. Retrieved 15 March 2012. ^ "'THE HOBBIT: AN UNEXPECTED JOURNEY' GROSSES $15.1 MILLION IN 452 IMAX THEATRES WORLDWIDE IN ITS OPENING WEEKEND". boxoffice.com. 17 December 2012. Archived from the original on 29 January 2013. Retrieved 24 December 2012. ^ McClintock, Pamela (14 December 2012). "Box Office Report: 'The Hobbit' Grosses $16 Million Overseas on Thursday". The Hollywood Reporter. Retrieved 24 December 2012. ^ Subers, Ray (14 December 2012). "Forecast: 'The Hobbit' Expected to Set December Opening Record". Box Office Mojo. Retrieved 24 December 2012. ^ "The Hobbit: An Unexpected Journey (2012) – Daily Box Office Results". Box Office Mojo. Retrieved 24 December 2012. ^ Subers, Ray (14 December 2012). "Friday Report: 'The Hobbit' Steals $37.5 Million". Box Office Mojo. Retrieved 24 December 2012. ^ a b "Weekend Report: 'Hobbit' Takes December Record, Misses $100 Million". Box Office Mojo. Retrieved 17 December 2012. ^ "Weekend Report: 'Hobbit' Plummets, Holds Off Slew of Newcomers". Box Office Mojo. Retrieved 23 December 2012. ^ "Weekend Report: 'Hobbit' Holds Off 'Django' on Final Weekend of 2012". Box Office Mojo. Retrieved 30 December 2012. ^ "UPDATED: $138 Million for 'The Hobbit' Overseas". boxoffice.com. 13 December 2012. Archived from the original on 17 December 2012. Retrieved 24 December 2012. ^ Subers, Ray (18 December 2012). "Around-the-World Roundup: 'The Hobbit' Collects $138 Million Overseas". Box Office Mojo. Retrieved 24 December 2012. ^ Subers, Ray (23 December 2012). "Around-the-World Roundup: 'Hobbit' Adds $96 Million Overseas". Box Office Mojo. Retrieved 24 December 2012. ^ "Hobbit gets positive reviews although doubts surface". Television New Zealand. 4 December 2012. Retrieved 30 January 2013. ^ Hughes, Mark (15 December 2012). "Critics Um, But Audiences In Awe – 'The Hobbit' Wins Huge Opening And High Ratings". Forbes. Retrieved 15 January 2013. ^ Gettell, Oliver (14 December 2012). "'The Hobbit' stumbles on first leg of its journey, critics say". Los Angeles Times. Retrieved 15 January 2013. ^ "The Hobbit: An Unexpected Journey". Rotten Tomatoes. Fandango. Retrieved 17 February 2019. ^ "The Hobbit: An Unexpected Journey Reviews, Ratings, Credits, and More". Metacritic. Retrieved 8 January 2013. ^ Gower, Eleanor (5 December 2012). "Hobbit reviews good, not great". London: Daily Mail. Retrieved 10 February 2013. ^ "The Hobbit: An Unexpected Journey Reviews". ABC News. Retrieved 10 February 2013. ^ McClintock, Pamela (16 December 2012). "Box Office Report: Peter Jackson's 'The Hobbit' Scores Record $84.8 Million Weekend". The Hollywood Reporter. Retrieved 15 February 2013. ^ "The Hobbit Review". Rolling Stone. Retrieved 15 December 2012. ^ Collin, Robbie (9 December 2012). "The Hobbit – An Unexpected Journey, film review". London: The Telegraph. Retrieved 9 December 2012. ^ "The Hobbit: An Unexpected Journey (PG-13)". Time Out. Retrieved 16 December 2012. ^ "The Hobbit: An Unexpected Journey – review". The Guardian. Retrieved 16 December 2012. ^ "'The Hobbit': Like One Bad Video Game". theatlanticwire.com. Retrieved 16 December 2012. ^ Leyland, Matthew. "The Hobbit Review". Total Magazine. Retrieved 9 December 2012. ^ Gonzalez, Ed. "The Hobbit Review". Slant Magazine. Retrieved 9 December 2012. ^ McCarthy, Todd. "The Hobbit Review". The Hollywood Reporter. Retrieved 9 December 2012. ^ Muir, Kate. "The Hobbit Review". The Times. Retrieved 9 December 2012. ^ Jolin, Dan. "The Hobbit Review". Empire. Retrieved 9 December 2012. ^ "The Hobbit picks up technical Oscar". BBC News. 11 February 2013. ^ "The Hobbit and Les Miserables up for audio awards". 3 News NZ. 9 January 2013. ^ Truitt, Brian (20 February 2013). "'The Hobbit' leads Saturn Awards with nine nomination". USA Today. ^ "Nominations for 39th annual Saturn Awards unveiled". Archived from the original on 25 February 2013. ^ O'Hara, Helen (1 March 2013). "Jameson Empire Awards 2013 Are Go!". Empire. Retrieved 21 March 2013. ^ "2013 MTV Movie Awards Nominations: Full List". abc.com. Retrieved 7 March 2013. Wikimedia Commons has media related to The Hobbit: An Unexpected Journey. "The Hobbit: An Unexpected Journey". Tolkien Gateway.